How This Dan Brown Masterclass Review Was Done? If this is your first time on RealReviewHub.com we always think it’s important to give context as to who exactly is doing the review and how it was done so you have the proper context going into the Dan Brown Masterclass Review. Follow this link if you are looking for our complete Masterclass Review. If we decide a product is worth buying- We will give it a Buy Rating, sometimes the links to these courses, products, or software will be in the form of an affiliate link where the seller may pay us a small commission for referring the buyer over to them. If you decide to use our link to make a purchase- Thank You. We really appreciate it as it helps the site keep to going and helps funds our next product reviews. But if you find the review helpful and decide to purchase without wanting us to earn a commission, then NO HARD FEELINGS! We are glad you stopped by, just google the seller directly to make your purchase! We hope it was helpful. Why did we create RealReviewHub.com? 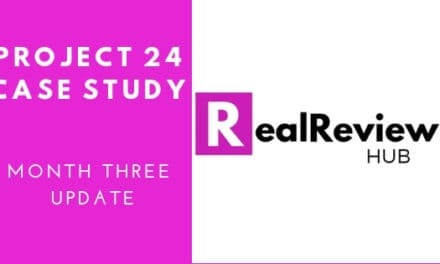 Because honest reviews are one of the best ways to learn valuable information on a product before you decide to spend your hard earned money on it, and we take that serious at RealReviewHub.com. We also know that the internet is full of fake reviews trying to make affiliate commissions. We wanted to help fill that gap in the market place and provide useful information you can use on your way to purchasing the course, product, or software reviewed here. Continue below to get into the review. Here is our Proof of Purchase for Dan Brown Teaches Writing Thrillers Masterclass. We purchased an All-Access Pass for $180, which is good for 1 year and grants access to all of the Masterclass classes for one price. You can purchase individual classes for $90. 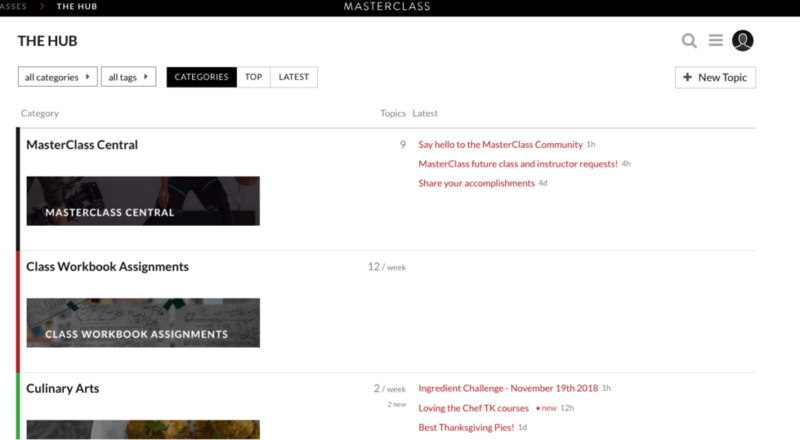 But what we wanted to do is give an idea of the overall value of their higher priced membership, and with that, we plan on doing a series of in-depth reviews for individual classes in the Masterclass Library. So here is a copy of the receipt for the purchase of Masterclass All-Access Pass, to prove we put our money where our mouth is at RealReviewHub.com. Dan Brown is the author of several books, including, The Da Vinci Code, which has become one of the bestselling novels of all time as well as the subject of intellectual debate among readers and scholars. You will meet your new instructor: best-selling author Dan Brown. In your first lesson, Dan lays out the practical takeaways you’ll get in his class and provides his first lesson in suspense. In this lesson, Dan shares what he loves about books and his perspective on writing books. He gives insight into what he thinks is important for the reader and the obligations the writer has. He lays out his first lesson in “Suspense” in a really cool way. Dan shares his motivation in creating this Masterclass while laying out a process writers can use to tell great stories. In doing so he talks about his family history and the importance of various teachers in his life. He talks about a lot of the advice he got when he started out as a writer and how a lot of it was theory and not necessarily that actionable. He explains that he intends to give writers some truly practicable and actionable tools for writers to use in their writing careers. This Lesson comes with a Downloadable PDF that recaps the major takeaways from the lesson. Talks about learning about the key elements that must be in every story. He uses a great car analogy to explain these story elements. He lays out some of these main elements in broad strokes during this lesson. He talks about these Three C’s in detail and how it helps to lay out the core of his thrillers. This lesson was really helpful in helping you frame up what you are trying to accomplish when writing a thriller. The way he lays out these 3 Cs makes a lot of sense and helps to really capture the essence of a thriller. Really liked this part (TAKE NOTES). Dan talks about what makes a book a thriller is the pace of the story. He talks about how to start a novel quickly to hook your readers and how you want to go about answering those hooks or promises to create the pace. A Great takeaway form lesson 2 explains how suspense is all about the promises you make to the reader. Dan also talks about the importance of reading as a writer, a little bit about his reader journey and how it helped influence him as a writer. He also gives some examples from well-known thrillers that help to illustrate the points he makes during this lesson. Interesting insight into how he wrote Digital Fortress first and how he was a young novelist and how it was helping find Langdon. 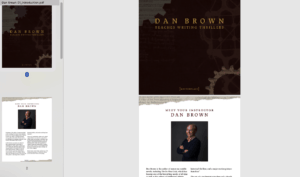 Lesson 2 of Dan Brown’s Masterclass also comes with a full digital download of the lesson. Here is a review of what you will learn in lesson 3 of Dan Brown’s Masterclass. Talks about an artist need to create, writers are no different. As a writer, Dan writes the thriller he would want to read and the how important that is for writers to do, write the thriller you would want to read. Dan turns the old adage of write what you know on its head, he suggests writing what you want to know. The importance of choosing what your interested in so that this will come out in your writing. This is how excitement will come out in your story. This teaches to lean on your inquisitive nature to write thrillers on any topic. Using the internet now allows you to write books about places you’ve never been to. Writing a novel is hard work- choose a topic you are going to be excited about for the duration. Dan talks about the problem of wanting to write a novel but not having a big idea. He talks about how to come up with your idea from finding the world you want to write in. Once you find this world you can write a novel from the thousands of questions that will arise from that world. He gives you easy ways to find ideas. Dan talks about outlining your novel with a single driving question. Use this driving question to start creating your novel. He makes the process seem manageable by finding your single question and using that as a compass to lay out the rest of your novel. This question is building the foundation for your book. He also talks about what kind of questions you want to choose to make sure your story has more depth and texture. He gives a great real-life example that happened to him as a teacher that lead him down the path to finding a beautiful morally ambiguous question that led to Digital fortress. He gives the driving question between Angels and Demons and shows how the right topic does most of the heavy lifting for your novel. Also, Dan talks about thinking about your question not like a writer but like a philosopher to help you find that truly compelling question and a big idea. He goes into how he used this philosopher hat to think of the big idea for the Divinci code and then how he put his writer’s hat to flush out the story. Overall he talks about how it’s not about the Big Idea itself, meaning not the what but the how that really makes the question compelling. He explains how to take the pressure off of yourself for the Big Idea, but instead, your job as a thriller writer is how you drive you’re the story through that big idea. At the end of this lesson, Dan gives two very practical ideas that can help you decide which idea you should go with if you are struggling to pick the winning idea. These made a lot of sense when you heard them and was definitely helpful for writers that might be affraid of picking the wrong big idea for their next story. **Lesson 3 Comes with a Downloadable PDF of the Lesson to go along with the Video. Learn how to use location to create interest, generate suspense, and build the structure of your book. Dan talks about thinking of locations when he writes. He goes beyond thinking of locations as a character but how it can help you frame your book. It allows you to add intrigue and weight of what is going on for your readers. He explains how location is a great tool to help give structure to book. He also talks about how you use locations to find inspiration and plot points in your book. He gives you a warning about using the location as a tool but avoids turning into a travel journey. It reminds you to keep a good flavor of the location but keep it about the characters. Dan teaches his techniques for crafting heroes that your readers will connect with on a human level. Then, learn how to create complex villains who function as catalysts for action and conflict. In the first half of this lesson, Dan talks about the importance of characters and choosing a hero that is suited to the world. He also talks about how characters in thrillers can be ordinary people put in extraordinary situations. Talks about writing your villain first. This will help you define your hero. He talks about how the Villain can help create the hero character. The importance of creating a worthy opponent. He talks about how to make your villains more interesting, avoid them being flat. How this creates a more interesting story for your readers. How to make these Villains motivated by more than surface level things. He talks about introducing your Villian the right way. According to Dan, there is only one way to introduce the Villian, interestingly enough he gives very real examples that even hold up in Disney Movies!! In the second half of this lesson, Dan turns his attention to the hero. He talks about what he wants to do when he creates a hero. How he creates strengths and weaknesses in his hero to make them more relatable. Also, he talks about injecting humor in his heroes to lighten the tension. He relates his passions an people he admires in his heroes and tells you how to do that in your heroes as well. Dan also explains how the stakes you create need to be important to the character to make it impactful and how that’s how you make a thriller where the stakes are captivating. Make sure you don’t rely on too much coincidence. He explains how you can be easier on your villain than you can be on your hero to make sure your readers find your story believable. Lesson 5 of Dan Brown’s Masterclass comes with a downloadable PDF to accompany the Video. Dan shares valuable tips for developing authentic secondary characters and teaches you how to strategically design relationships between characters to maximize conflict and drive plot. How to start populating your novel with secondary characters once you have your hero developed. He talks about pairing your hero with secondary characters that can help compliment each other to give yourself more options as a writer. He talks about Langdon and how his love interests and secondary characters can instill instant tension with no effort. Dan challenges the misconception about having to know every single thing about every character before you start writing. He talks about how that can be overwhelming, but if you let the plot drive what characters you need. Start with a character or two and then let your plot dictate which character you need. Dan shares a story about a character in Angels in Demons, and how he added a back story about flying a helicopter only when he needed someone to fly a helicopter later in the story. So let the plot decide. Dan says there is one thing that you need to know about every single character. You need to know what they want. You may not share that with the reader right away but you need to know it. You need to know what that character wants and why can’t they have it. He talks about how he decides on how many characters should be in a book. He will always try to accomplish his stories with the fewest amount of people possible. He explains how this helps the readers have a better reading experience. Dan gives a trick about how he goes about introducing new characters to make them memorable. Plus how he sends clues to readers about characters they need to remember and which they don’t. Challenge your readers but not with trying to remember which character is which. The first thing he tries to do when populating a world with characters is to create characters with opposing opinions. He explains why this is important to create tension. So having characters at opposite ends of the spectrum is good. Dan talks about a trick of using past relationships to help bring instant information to the reader and all the baggage that can create with one sentence. Dan talks about how inferring relationships allows the readers to impose human experience into those relationships for the author. Remember as a writer you are creating a story with a partner, the reader. So when you are writing a novel you are writing millions of stories since everyone will read the story differently. The use of inner monologue in getting into a character’s head is a great tool that helps you develop your character for your readers naturally. As they interact with the outside world, the reader the will get insight into the character. Dan takes a detailed look at the characters from his best-selling novel, The Da Vinci Code, to illustrate how different character types can be used to create suspense and propel the narrative. He talks about how each of the characters in the DaVinci Code serves a different purpose. He talks about how that main character is the spine of the book but the other characters. He talks about putting the hero in physical danger for a thriller and how it ups the stakes of the story. How he accomplished that with the muscle character. The threat of this character raises the stakes. Talks about how some characters or villains are out front but there are also villains in the shadows that are other tools a writer can use. He talks about presenting some of the crazier ideas of the holy grail but he needed to protect Robert Langdon’s integrity as a scholar so he created a secondary character to have fun with that. Dan talks about having fun as a thriller writer by misdirecting the reader, but how that is part of the fun as reader and writer. The Red Herring is a great tool and way to have fun as a writer. This lesson essentially plays clips from the Da Vinci code showing specific characters that Dan Brown created to serve a specific purpose in the overall plot. Great examples here. Lesson 7 of Dan Brown’s Masterclass comes with a downloadable PDF File. The writing exercise in this lesson is pretty cool as it makes you write down every character in your book and the purpose they serve. A great way to get to the heart of why your characters exist. For Dan, research is one of the most important parts of his creative process. Learn how to use on-location research and subject-matter experts to bring specificity and authenticity to your writing. What Lesson 8 is about? He starts off by explaining the first type of research which is exciting and a way of learning and narrowing down on an idea. The second type of research is different – it is a way to dive deep into making both sides of the grey area arguments, and research, and giving color and depth to your story. He explains how everything comes from research and the knowledge your gain from the research you are doing. This will help you with the setting, building your counter-arguments. This type of research will help in writing your novel easier and inspire decisions for you. When researching- it all starts with reading, but there is a point when you need to talk to real people. Find specialists to help you understand reality beyond what you can learn from a book. You also will get an idea for characters by talking to real people. Gives an example of talking to people about what they are passionate about to get incredible insight and specifics to make your novel accurate. Before you go talk to a specialist doing research is important so you don’t waste their time. Be honest but be prepared. He talks about how important it is to absorb as much as possible on location. Going with the tools that make it possible to create as much information as possible as quickly as possible. He talks about the power of video in learning a space. Dan goes deeper into his research process to show you how he uncovers the shocking connections between seemingly unrelated elements in his stories. Dan talks about one of your jobs as a thriller writer is to make connections the reader doesn’t see coming. You do a lot of research and that doing a lot of research is the key to finding links between different threads. So you need to do enough research to find the answers. You don’t need all the answers at first, but when you find the threads, you make notes to dive into those threads more deeply to make connections. Explains when he starts to research a book he doesn’t think about structure and plot but he wants the ideas to germinate and find their connections. Find the ingredients to inspire you with the start of a novel. The most important thing you are going to do as a writer is editing, knowing what you can leave out. Know what research to leave out of your book. You always need to look at research and know how it serves your next book. The research you can’t use now can be used in a different book. He talks about being very factual in a world of fictional characters and how that helps teach something but keeps everything real. He gives a great example of being called out by readers on a small creative license you will surely laugh at! He warns about guarding against research becoming procrastination. He gives a great tip on how to move along and keep writing even when you don’t know something, so you don’t have to stop and research right then. From the initial idea to the final chapter, Dan walks you through his entire process for building a story and provides a step-by-step guide to transforming your vision into a captivating thriller. In this lesson, Dan walks you through the process of building a thriller from the ground up. Watch Dan create a thriller from an example of a world based in the world of winemaking? What is the moral question? Come up with Villain and extraordinary circumstances. Now on to the middle- how to figure out what goes in the middle. One of the tools is choosing locations where you want things to happen. Let locations do some of the work for you. Next, you want to think about what characters they might run into, that can work in synergy with your hero. Using them to Ratchet up the stakes – how you raise the stakes quickly, giving them a secret backstory to escalate the tension further. Big Obstacles your hero can overcome will make them heroic. Paint them into a corner and have them find a way past that obstacle. Controlling the flow of information and giving your readers something that they don’t expect. Using parallel plot points to build suspense is a way to remind your reader of the stakes. This lesson was pretty great. You see Dan build a thriller out of thin air using a topic that seems pretty blaze (winemaking) at first. It really helps to pull these concepts through for the student. Here are some student comments on Lesson 10 of Dan’s Class. Using his novel, Origin, and exclusive content from a never-before-seen project, Dan explains how to use parallel plotlines and dramatic opening paragraphs to create suspense that will keep readers turning the pages. Dan discusses the Toolbox to create suspense. Looks at Origin and how smaller storylines commutatively affect bigger picture to build suspense. He shares a 1-page prologue to a book he never wrote- PRETTY COOL!!! Ticking Clock Excercise for any story to add suspense – Compress the timeline to create suspense. This lesson is great its to the point, gives you a ton of suspense building writing tools to use in your thriller. Dan teaches you his strategies to pull your readers into your scenes and craft cliffhangers that will leave them on the edge of their seats. 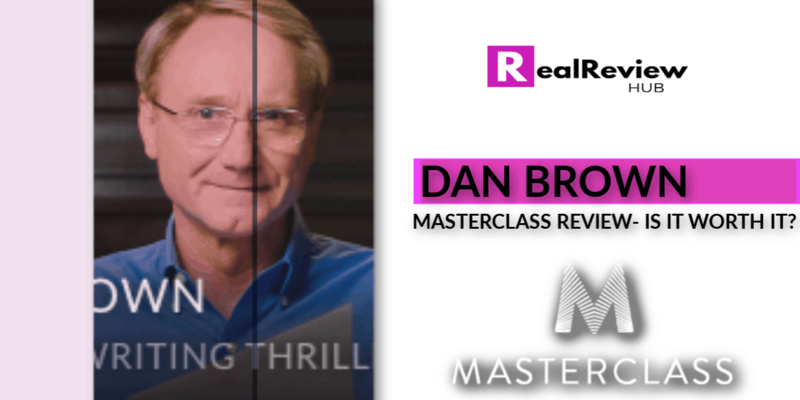 What is Lesson 12 of Dan Brown’s Masterclass all about? The difference between starting a chapter one way that is nice but lacks tension, and another way that creates instant suspense. Start Chapter with a sense of discomfort or tension. Avoid getting into a chapter LATE! Pull your reader in right away. The concept of the Cliffhanger. Making the reader have a need to turn the page. Can do it by posing a question, answering a question with a surprising answer, or a twist. – Trick end your chapter a bit earlier. Moment of revelation is another way to create a cliffhanger. Create Suspense through withholding – have a character react to something but don’t show it to the reader quite yet. Knowing where to cut your scenes and chapters to cut suspense. Great ideas on how to make the obstacles as hard as they can be for the hero. The idea of using pulses – tiny moments that remind the reader of something. Learn Dan’s guiding principles for moving from an outline into a first draft, including how to develop stand-out, big moments and manipulate tension and release. Review of What You Will Learn in Lesson 13 of Dan Brown Teaches Writing Thrillers. Create 1 bullet point – what is this chapter trying to accomplish. 1 Hook for the chapter, all different types of hooks. Great example he uses from the Da Vinci Code- Langdon Reacting to a photo but the reader doesn’t get to see in this chapter. The parallel between a story in music and writing. Using treasure hunts to be fun for the reader – make the challenges interesting to you and put them in the novel, the knowledge and enthusiasm will come through for the reader. Dan teaches you how to strategically use narrative point of view to maximize suspense, withhold information, and reveal character. More Controlled Point of View (Each chapter have one person as a point of view for each scene.) Gives the reader a very specific way to experience that scene. Controlling point of view grounds the reader into the action. Different Chapters use a different point of view characters to best reveal the chapter. Which character has most to lose or learn? Use POV to withhold information so you can fairly share information. Help you readers know the point of view you are in. Use words like Sofie Felt Tired, so we know we are in Sofie’s head. Shifting point of view can add variety from chapter to chapter. Give the readers all the information you want and nothing more with the right point of view. Breaking up chapters with section breaks when you are jumping characters to keep from confusing your readers. Point of view dictates the specific sets of rules as to what you can access and what you can’t. The plot should decide what you are telling the reader, which will then help decide Point of View for each scene. Writing a scene form Origin from 3 different points of view before Dan got it right. A great example of needing to change point of view from a scene a year later because it was important to what happened later. Learn how to craft exposition that appeals to your reader’s senses and write dialogue that communicates essential information while simultaneously revealing character. Exposition – appeal to your reader’s senses. Great tip- how readers experience the world. Have characters describe what they saw. The eye should travel like a human. The effect of this subtle technique of how the eye moves naturally is huge. The best writing is writing that simply communicates. The Best Prose should be transparent. The language should match what’s appropriate to the story. Your job is to keep them in the story. Your reader should only be mystified on purpose not because you’ve messed up. The use of flashbacks as a great tool. If there is a lot of information, sometimes it’s easier to flashback and experience scene as it happened in the past. Delineate the beginning and end of flashback very clearly. Make sure you keep these smooth, try adding a couple lines in the past perfect to quickly into the past tense. Dan shares his practical system for tracking the status of an edit and demonstrates how to strengthen your project through revision. When it comes to writing, Dan’s philosophy is simple: protect the process and the results will take care of themselves. Learn how to beat writer’s block and structure your writing habits in a way that maximizes your creative output. Dan explains the importance of persistence, shares tips on how to build a team that believes in you, and teaches you how to write a query letter that will stand out in agency slush piles. Dan provides parting words of wisdom and encouragement and reveals the never-before-seen artifact he promised to share in the first lesson of his class. 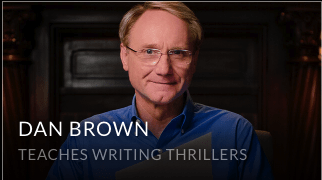 A Great feature of Dan Brown Teaches Writing Thrillers Masterclass is the Office Hours. This a chance to ask questions to Dan himself in either written or recorded form. This is a pretty cool course feature that masterclass offers. PreviousMasterclass Review- Is It Really Worth It? & What You Need to Know.